Zhe Han, Ph.D., (pictured) and Patricio E. Ray, M.D., have received a $3 million, five-year grant from the National Institutes of Health to study the mechanisms behind APOL1 and HIV nephropathies in children, using a combination of Drosophila models, cultured human podocytes and a preclinical model. 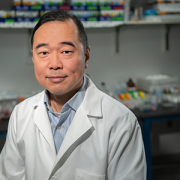 Two Children’s researchers have received a $3 million, five-year grant from the National Institutes of Health (NIH) to study the mechanisms of APOL1 and HIV nephropathies in children, using a combination of Drosophila models, cultured human podocytes and a preclinical model. The APOL1 genetic variants G1 and G2, found almost exclusively in people of African ancestry, lead to a four-fold higher risk of end-stage kidney disease. HIV infection alone also increases the risk of kidney disease but not significantly. However, HIV-positive people who also carry the APOL1 risk alleles G1 or G2 are about 30 times more likely to develop HIV-nephropathy (HIVAN) and chronic kidney disease. For more than 25 years, Children’s pediatric nephrology program has studied HIV/renal diseases and recently developed Drosophila APOL1-G0 and G1 transgenic lines. That pioneering research suggests that HIV-1 acts as a “second hit,” precipitating HIV-renal disease in children by infecting podocytes through a mechanism that increases expression of the APOL1-RA beyond toxic thresholds. 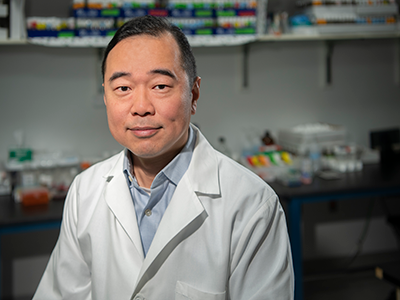 With this new infusion of NIH funding, labs led by Zhe Han, Ph.D., and Patricio E. Ray, M.D., will determine the phenotype of Drosophila Tg lines that express APOL1-G0/G1/G2 and four HIV genes in nephrocytes to assess how they affect structure and function. The teams also will determine whether APOL1-RA precipitates the death of nephrocytes expressing HIV genes by affecting autophagic flux. 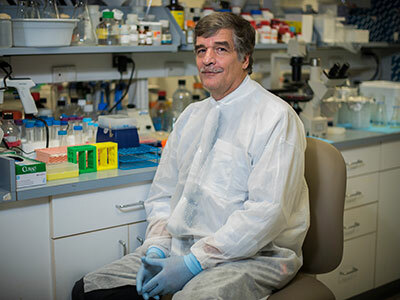 “Our work will close a critical gap in understanding about how HIV-1 interacts with the APOL1 risk variants in renal cells to trigger chronic kidney disease, and we will develop the first APOL1/HIV transgenic fly model to explore these genetic interactions in order to screen new drugs to treat these renal diseases,” says Dr. Ray, a Children’s nephrologist. While a large number of people from Africa have two copies of APOL1 risk alleles, they do not necessarily develop kidney disease. However, if a patient has two copies of APOL1 risk alleles and is HIV-positive, they almost certainly will develop kidney disease. The team hypothesizes that even as an active HIV infection is held in check by powerful new medicines, preventing the virus from proliferating or infecting new cells, HIV can act as a Trojan horse by making the human cells it infects express HIV protein. To investigate this hypothesis, the team will create a series of fly models, each expressing a major HIV protein, and will test the genetic interaction between these HIV genes with APOL1. Similar studies also will be performed using cultured human podocytes. Identified synergy will be studied further using biochemical and transcription profile analyses.